Address: Tres de Mayo esquina Aurea Díaz Flores, Santa Cruz de Tenerife (Tenerife), Islas Canarias. Set in Santa Cruz's financial and commercial centre, Silken Atlántida offers panoramic sea views from its glass lifts. It has a rooftop terrace, and rooms with free Wi-Fi and hydromassage showers. The hotel has an on-site fitness centre, as well as a sun terrace, 2 saunas and 2 hot tubs. The Silken Club Executive Floor also offers an exclusive service including 24-hour coffee and cakes, free Wi-Fi and daily newspapers. The Atlántida Santa Cruz has bright, attractive rooms with classic décor. All air-conditioned rooms feature a safe, satellite TV and city or sea views. The restaurant offers a selection of Mediterranean cuisine, traditional Canarian dishes and a varied wine selection. Guests can enjoy local wines and pintxos dishes in the hotel's Gastrobar. 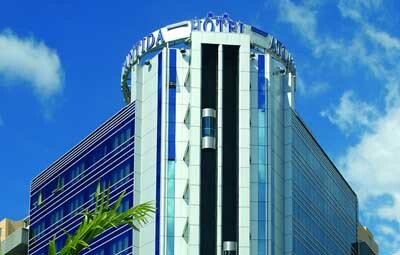 The Atlántida is a 15-minute drive from Playa Teresitas Beach and 10 minutes’ walk from Calatrava’s impressive Convention Centre. Tenerife’s Norte Airport is just 10 minutes’ drive away.